These cards are the heroes you choose to fight with. Each deck has 6 Champions, which have their own set of stats and unique ability. Only one of your Champions can fight at a time. This is called your "Active Champion." Your other Champions remain on your "Bench" until your current active Champion has been defeated. If all your Champions are defeated, you lose the game. When a Champion is defeated, you flip the card to show that Champion is no longer in play and discard all cards attached. That Champion then becomes a "Trophy." If your active Champion is defeated, you must pick a new Champion on your bench to take your previous Champion's place. When you have no more Champions left to fight, you have lost the game. 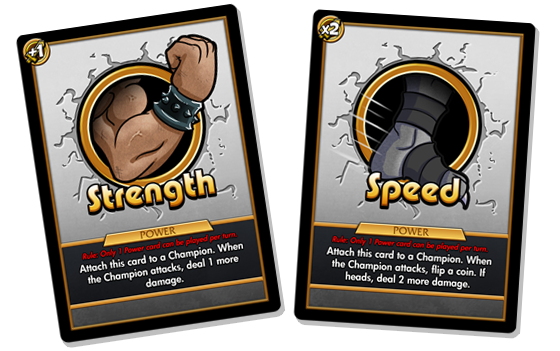 These cards act as a resource in the game by increasing the Attack and Defense value of your Champions. To play a Power Card, you "attach" the card to any one of your Champion by placing the card underneath the Champion card. Notice icon in the top left corner of the card and position the card so it pops up under your Champion card to easily read all your bonuses. You can only attach one Power card during your turn, but you can attach a Power card to any of your Champions. 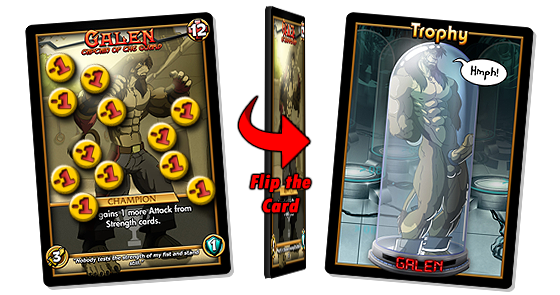 Some Power cards require you to flip a coin (or roll a dice) when attacking. If you succeed, you will get the card's bonus. These Power cards allow you to increase a Champion's power much faster by taking a chance. These cards have a one-time effect on the game, so you discard the card after playing it. There are a large variety of Instant cards and they can easily change the state of the game. The key to winning any game is knowing when to play your Instant cards. 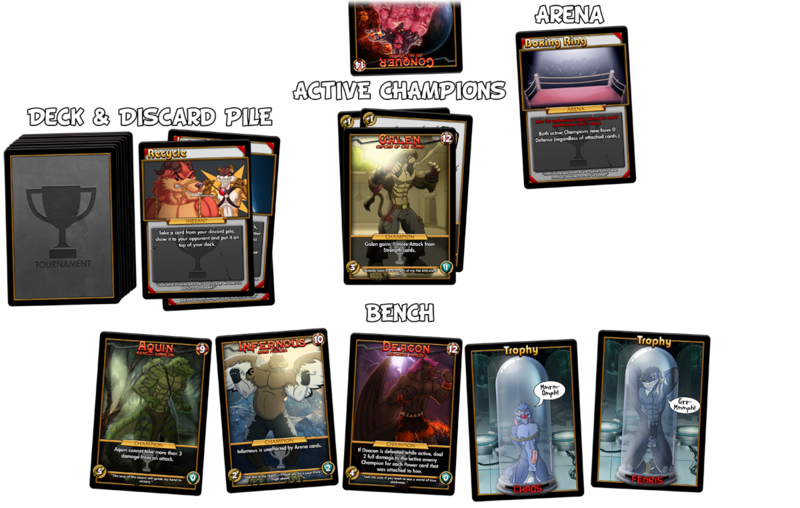 For example, Strip Naked punishes a player for attaching too many Power cards to the same Champion while holding on to Evil Gloating will give you more cards later in the game but slow you down early in the game. it means you may discard the card to draw a new card. These cards remain permanently in play, but only one Arena card can be active at a time. Keeping an arena in play is a contest between you and your opponent, and the card affects both active Champions equally. Playing an Arena card is about knowing when you gain more from the effect than your opponent. 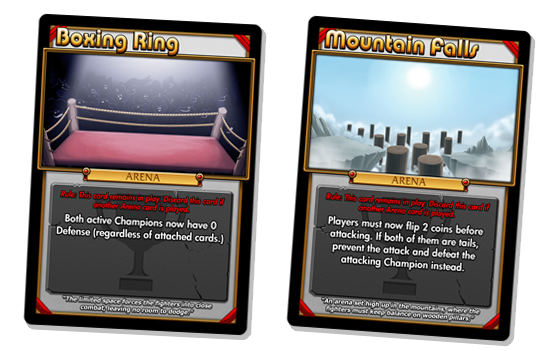 For example, Boxing Ring rewards you for not using any Power cards that increase Defense while Mountain Falls is incredibly strong on a Champion like "Infernous" who has the ability to ignore Arena cards. 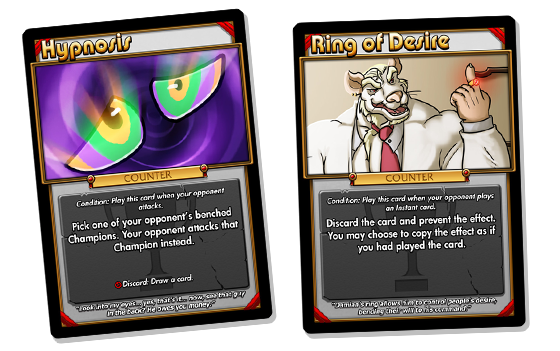 These cards act as a defense against your opponent's moves and can be played during your opponent's turn. Every counter card can only be played in relation to a specific type of action and you discard the card after use like an Instant card. Counter cards allow you to keep your Champions in the battle longer by protecting them from defeat. For example, Hypnosis can be used to misdirect a powerful attack against you on to your opponent's own Champions and Ring of Desire allows you to steal away an Instant card played by your opponent. Your active Champion is in the center of the board, pitched against your opponent's active Champion. The current Arena is placed next to both of the active Champions (facing the player who owns the card). You keep your Deck and Discard Pile on the left or right side of your board (depending on your own preference). Your bench is on the back of your board in a line behind your active Champion. When starting the game, both player draws 5 cards from their deck and lays out their 6 Champion cards on the Bench. You then decide who takes the first turn (roll a dice, flip a coin or rock-paper-scissors). The player player who goes first also picks his or her active Champion first. The player who goes second then picks his or her active Champion (allowing the player to counter the opponent's pick). The player who goes first then his turn. Start by drawing a card from your deck. If you have no more cards left in your deck to draw, shuffle your discard pile and turn it into your deck, then pass your turn. Attach a Power card to anyone of your (undefeated) Champions. Play any number of Instant cards. You finish your turn by attacking your opponent's active Champion. If you cannot attack due to the effect of a card, you pass your turn instead. These are only necessary to read for those who like to know everything about the game! This is a list of all the specific rules in the game. You can see all the cards in question here. Every deck must consist of 30 cards and 6 champion cards. You cannot have more than one copy of any card in your deck, except for Power cards. If you disable Aquin's or Felix's ability with Disable or Avardo no Clothia, their ability will not reduce damage for the duration of the effect. Likewise, if Deacon's ability is disabled when he is defeated the ability will not trigger. If you play an Instant that defeats the active enemy Champion on its own with Chaos active, the new active Champion does not take 1 full damage from his ability. If you play Ace against Michael, the first one to cause damage to the other will cause their abilities to trigger endlessly until one has defeated the other. If you play Toontown and poison a Champion with Daniel, the poison will heal rather than deal damage. If Avardo no Clothia or Seal Away is countered by Ring of Desire, you still have to discard the cards to meet the requirement and your opponent may copy the effect without meeting the requirement. If you copy cards that end your turn like Kidnapping or Vacation with Ring of Desire, you still get your turn since it was in fact not your turn when you played the card. If you play Brawl and one of the Champions are defeated by the damage before the end of the effect, continue until 5 heads have been flipped before defeating any Champions. If you play Last Stand when defeated by an attack while Battlefield is active, the arena effect defeats the Champion since the damage occurs after the attack. If you play Gotta Catch 'Em All when you already have a bench full of Trophies, you don't win the Challenge since the objective is to fill your bench with Trophies and your bench is already full (you lack a Champion to take your Trophy's place). However, if you trigger the effect with Rampage, you win the contest. You know there's a part of me that says this is Actually Sylas master plan in some way. Anyway awesome. How does the "attaching" works? I see the instant-attunement card, with explanation: "take all cards attached to one of your champions and attach it to another", can you explain more about this? Say in a situation where 3 of my characters are defeated and I only have Deacon, Fenris, Galen; I attach Fenris and Deacon to Galen (active). then I get the instant attunement card from the deck, what should I do? Sorry I am not very familiar with this kind of card game. Oh sorry, I understand now, you can only attach power cards onto an active champion :) But I have another question, if I can only attach one power card to an active champion, how come the screencap in the Playing Field section shows 2 power cards attached to Galen? You can attach several Power cards to the same Champion, but you can only attach one per turn. This creates a ramp up mechanic where you have to decide which of your Champion's power you want to increase every turn. When you play Attunement, you can move all the Power cards attached from one Champion to another. 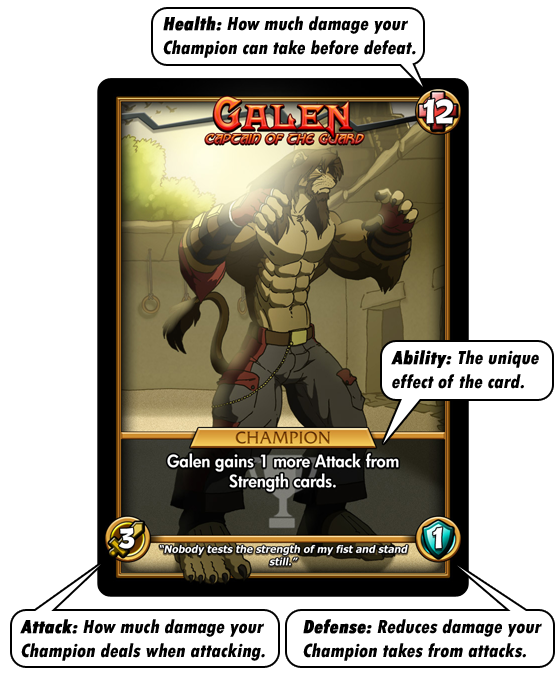 For example, let's say you've been beefing up Galen with a bunch of Strength and Agility cards, but he's starting to get low on health and you know he's about to get defeated. You then play Attunement and move all the Power cards from him to one of your benched Champions, so you don't lose all the cards you've played so far when he's defeated. OK, so you can only do that if you have the instant-attunement card. Got it. Unfortunately the subject makes it very, very hard to find a reliable host that would be willing to host an online service used to connect such a program, even if I had the programming skills or someone with such a talent. Not to mention more complicated factors like receiving additional permissions to use some of the other artist's artwork beyond the extend we already agreed on. This looks awesome. I look forward to playing this. I um kinda want to get the art you did for me for a previous tourney done as a card that me and others can use. I am totally fine being put into a card game. When I use instant card 'disable' , do I flip the enemy's champion's card I just disabled? You can turn the card to a different angle if that helps you keep track of champion cards whose ability is disabled. You can also use a marker. You could even draw a gag and cut it out on a little piece of paper. Whatever helps you play the game! I agree! You should create more deck Bogrim! With special power! If I use the Avardonoclothia to Fenris under the influence of Werewolf, will the card remove the Werewolf effect from Fenris? or no effect? Avardo no Clothia removes all cards attached to the champion, including shapeshift cards. So yes, Werewolf Form would get discarded as well and could result in Fenris' defeat if he has taken more damage than his normal health. Nice ... played the game with my friend and we had a tie! I used unfair deal so I defeated 2 of my only remaining champions to defeat my enemy's only remaining champion. It was fun.